This involves trying to scare away our feathered friends with the use of a plastic owl. I’m sure I’ve seen these amongst other wildlife merchandise in my local pound shop, but if you get stuck Gullstop can flog you one. . . If you combine these visual scarers with reflective items, such as old CDs hanging on string and sticks, and with something noisy, like a wind chime, you may have some luck. Well at least for a while, I guess it depends on how gullible the birds are in your area and whether your fellow allotmenteers can tolerate the clanging of those damned wind chimes! So this is part 10 (phew it was never meant to take this long!) of my account of what happened to me when I experienced a severe withdrawal reaction to Effexor. Previous posts can be found on the ‘Mental Health Story‘ page. This posts describes the Mental Health Review Tribunal, which led to me being released from Section 2 of the Mental Health Act. Unfortunately I was no more sane than when I arrived. My freedom eventually proved to be short lived, but that is another drama entirely, to save for another day. Time plodded on, but never linear, it whizzed around in a most precarious manner on the unit, speeding up, slowing down and sometimes going backwards. Nevertheless the day of my Mental Health Review Tribunal finally came. I had managed to keep out of trouble, no incidents, no therapy and most importantly no drugs. Smiles and ‘yes thank yous’ were my armour. The night before the tribunal, was unremarkable in this context. No sleep and an acutely distressed patient shouting and raging until the early hours – her islamic faith distorted into her personal battle to save us all from all our hideous attitudes and behaviours. I was told to stay in my room as the night staff tried to reason with her, – just go to sleep. It started with her wanting one of her cigarettes that were locked in the staff room – it ended with talk of teams coming down from other floors and injections. I desperately wanted her to be quiet, her shouts about the voice of Bin Laden and everyone perishing were scaring me. I hid under the quilt in my room trying to read the ‘Flower expert’ book that I had with me, brought in for me by my parents. As I read, I realised that this manual had been written specifically for me and that I was in telepathic contact with the authors. They were filling my head with nurturing thoughts, explaining how to look after myself – water regularly, full sun and provide nutrients. Sure enough morning came. With sun light, the fear that the darkness brought lifted, encouraging me to have hope and courage. The morning staff came on shift and I made myself presentable for the tribunal. I was called to meet with the Tribunal’s doctor. We met in the TV room of the men’s part of the unit, GMTV chattering innanely in the background as we discussed my mental state and my problems. Well when I say discussion, it was more of a game/quiz whereby the doctor would look at file notes, tell me what was going on in my mind and my life and then ask me a question. I would then put it into my own words and repeat his pet theories back to him. Fairly quick and painless, nothing too probing or demanding. I then met with my solicitor. The fourth one from the firm that were dealing with my case. He had all the notes taken by his colleagues in front of him and had about ten minutes to talk to me and figure out how we were gonna play this. He asked me what had been going on – so I told him. As he was on my side, an agent from a secret organisation that were trying to help me and save planet earth, I gave him the truth. He struggled to gain any sort of grip of the parameters of the conversaton and I became more and more animated, grateful to offload to someone who knew what was really going on in this clinic. I guess he could see that I was frightened and that suggesting none of this was true was making no difference to what I believed and felt. So he tried to make me feel better, telling me that the computers and TV in my house had been sorted out and that I was no longer being bugged and manipulated. He knew I needed to be calm and quiet in the tribunal if we had any chance of ‘winning’. He told me not to speak in the tribunal unless I am directly asked a question and he suggested that I let him field the questions. I don’t think that he had high hopes of the outcome being to let me go home. As I got up to leave, he suggested to me that I ask the staff to borrow a hair dryer. I looked at him quizzically, hanging on his every word, my saviour. He said “Your hair’s wet, its just that I don’t want you to get cold.” It wasn’t until much later that I realised or even cared that I had become so frail and why I provoked concern in people’s faces. It wasn’t too long before I was finally taken off the ward, along the corridor, down the lift and into the clinic’s reception area. Many long days and nights since I had made the reverse journey. My mum and a friend had come to support me and we waited as people milled around. I stayed quiet, confused by what was happening. I looked at my mum and friend, they smiled at me, reassuring me that everything was going to be ok.
An empty chair – which should have been occupied by someone from my Local Auhority’s mental health team …. I don’t think that I said more than a few words and my legal guy may have beaten me by a smattering more, but not by much. We didn’t seem to be in there a long time and I didn’t really understand what was being said. My ears pricked up when Dr Teddy spoke, telling everyone that I had suffered a psychotic break but that I was on the road to recovery. He felt that I should be transferred to an open ward, for further assessment and support. He then said something crucial – that I was not displaying any symptoms of a mental illness at present. The nurse confirmed and corroborated it, saying that apart from in the first few days, there had been no big issues or problems with me or my behaviour. The chair- persons attire dazzled me, a real natty dresser, with his braces and purple shirt which seemed to glow. I tried to understand what the head of the Freemasons was saying, he was very wise and had many old books that he read from – rules and regulations of how a Freemason should conduct themselves. I cocked my head, leaning in to listen, trying to make sense of what he was talking about. I looked around the room at people, they all gave me a little smile to pep up my spirits. Then all of a sudden the Grand Master told me that I was being released from section 2 of the Mental Health Act. He was grinning and smiling at me, I looked back at him, confused, I had only one question – “does that mean I can go home right now?”. He confirmed that I could, again beaming at me warmly, that guy really loved his job. he ought to be so detained in the interests of his own health or safety or with a view to the protection of other persons. We were kept loitering in the lobby for a while before we were taken back up to the ward so that I could collect my things. I burst into my room, with my mum and friend following me. A big male nurse came up to me and tried to interrupt my super quick packing, grunting at me in that ridiculous prison warden stance that many of the staff have: “patients aren’t allowed to have visitors in their room”. He seemed unaware that I had been in a tribunal or perhaps robotically dedicated to his role as rule enforcer. His tone of voice and my plan to leave immediately, resulted in me snapping at him something like “I’m not a patient anymore, so yes I can, I’m getting out of here”. I was no longer afraid of the staff here, with their cheap voodoo tricks and their bullying ways, no further need for politeness and smiles, I did not hide any of my contempt. He shuffled off and left us to it. I crammed my clothes into bin liners, exclaiming that the rancid smell coming off the dirty ones weren’t down to me, the horrible staff must have come in and done that to them when we were downstairs. I was getting mouthier by the minute. We didn’t hang around. We stopped when we had some food in a cafe close by. The freedom left me giddy and excited, I chattered at my Mum. Pontificating about the world, what was wrong with it and what was wrong with her. Not what you would call polite dinner conversation. Delusions upon delusion began to leach and then crash into my brain. Today is the end of the world, judgement day. All these people have come to see me and hope to have healing from being near me. They all know who I am, I am the second coming. I was not confused any more. I kept my more wacky thoughts to myself, but it was obvious that I was still very disturbed. I was determined to go home, so my mum reluctantly agreed that my friend would drive me. She returned to her home miles away with my soiled clothing to take care of instead. I, on the other hand was very excited – I would be safe as soon as I got home and there was a lot of work to be done to prepare for the new world. Quite simply erect some kinda bird bath. Whilst flicking through a gardening book I found this interesting tip from Bob Flowerdew, a regular on Radio 4’s Gardeners Question Time and described as Britain’s leading organic gardener. He says that birds aren’t eating your fruit for the food, as they are low in calories. The poor little things are gobbling your fruit for the moisture – they’re thirsty. Therefore put up bird baths, they’ll drink from these and your fruit hopefully won’t get touched, or at least not everything totally stripped. Sounds crazy I know, actively encouraging birds onto your plot, but maybe worth a shot… Also who am I to argue with Bob Flowerdew! Some of you may have read with envious eyes that we were lucky enough to be donated a fruit cage.. We duly constructed the cage, and promised ourselves that when the fruits from our strawberries, raspberries, back-currants, white-currants and gooseberries began to swell, we would put the roof on quick smart. We observed it happening, and confirmed to each other that next time we’d sort it. Yes you’ve guessed it – we didnt and our feathered friends have had a feast once again on our delicious fruit. At least it wasn’t rats or some other ‘uglier’ pest – I like birds a lot and feeding some possibly cancels out the bad karma that my cat may have recently brought on my household…. Meanwhile we are swimming in a sea of broad bean heaven, not only did we plant some might say a ridiculous amount, but the diligent pinching out of the tops of sap drenched new growth has thwarted a major attack from apids. Our plants look very healthy and not a spray or slug pellet has sneaked onto our plot, despite a savage month of relentless slug offensives on our poor defenceless seedlings. 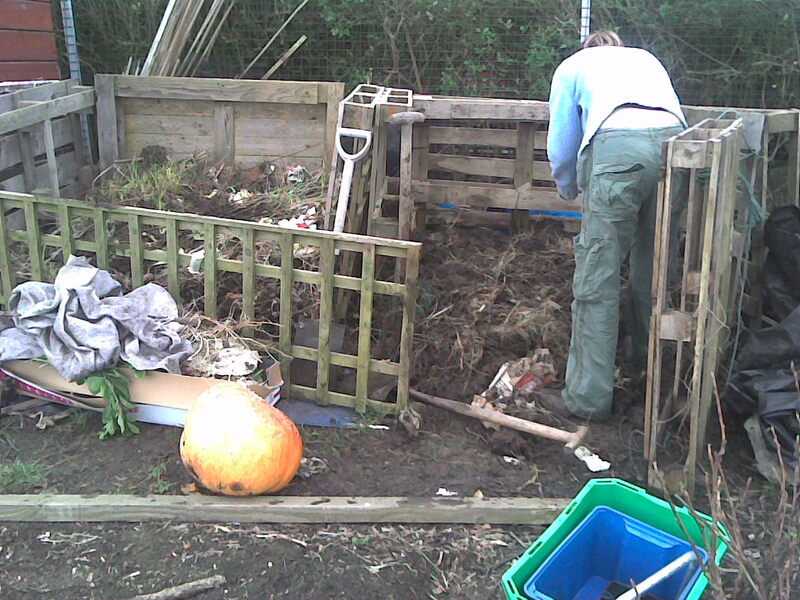 They were tempted away with our slug pubs, but there was a high casualty rate – french beans completely wiped out. 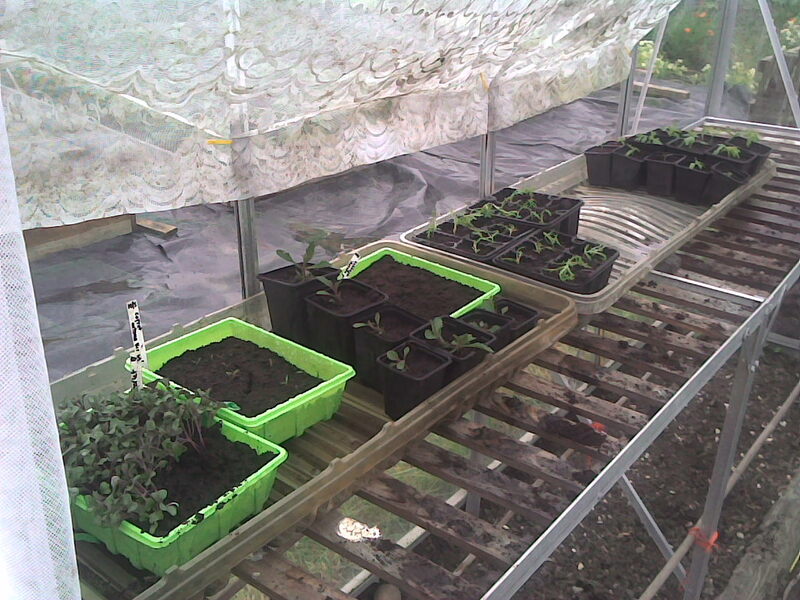 This resulted in us having to bring everything on in the green-house – to give them a fighting chance. We hope that now the birds are full of energy from our fruit they might turn their attention to molluscs… We also hope that our allotment neighbour is successful in her quest to build a pond, so that frogs can live nearby and feast on the slimey enemy. 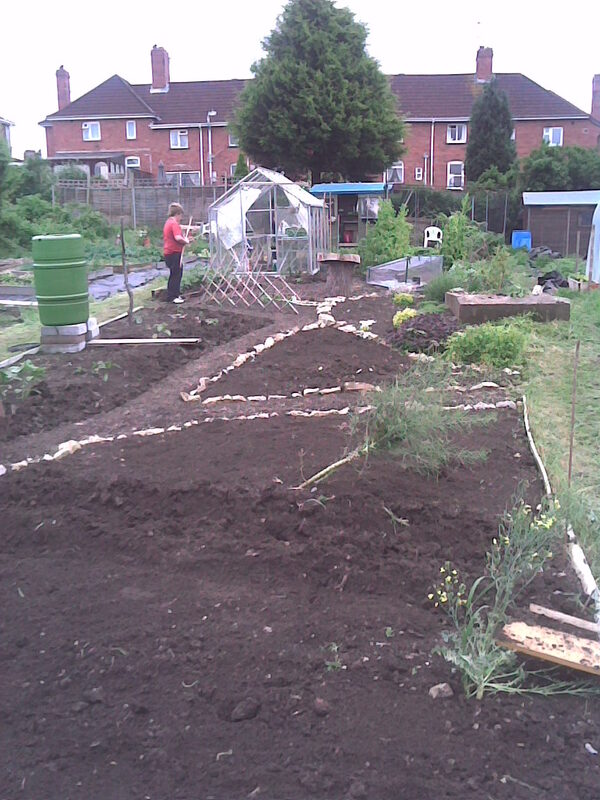 We are eagerly awaiting some pay back from the tomatoes, cucumbers, sweet corn, courgettes, and other goodies that are nestled in out plot, albeit a little bit later than we would have liked. Our plot is looking full again and bursting with colour and flowers. 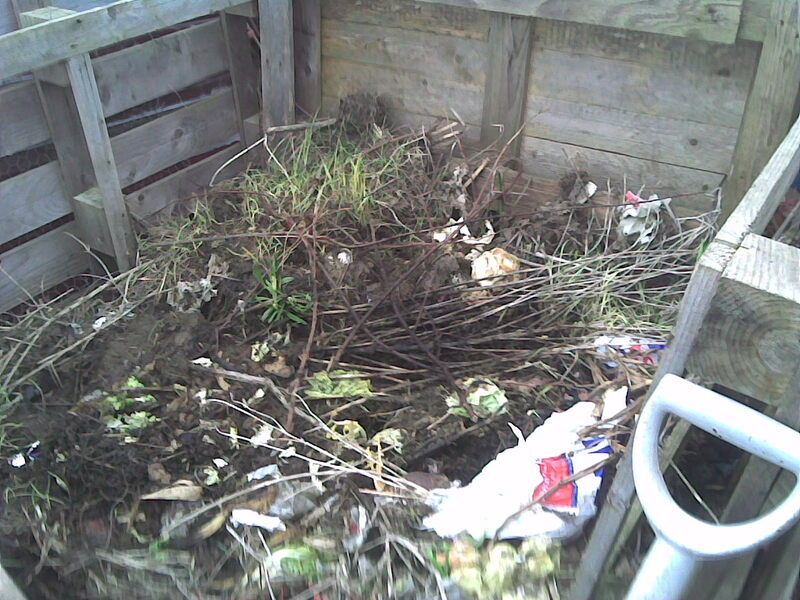 The weeds continue to try and upset us but nothing can dampen our spirits – not even the rain which we are getting in bucketfuls like the rest of the country. When its raining we dont have to tear up and down the plot trying to quench the thirst of our plants. All is good and its good to be a gardener! First we heard that Monty is taking a few weeks out from presenting BBC2’s ‘Gardeners World’ and then we hear that Monty has had a minor stroke and is stepping down from his role as lead presenter. A statement from Monty Don himself shows the attitude which as placed him number 1 on our list of ‘celebrity gardeners’. Monty Don is a fighter. We admire how he has taken the decision to concentrate on his recovery. He will surely succeed. “I am proud to have led GW for the past five years and have enjoyed every minute of sharing my passion with the programme’s viewers. Of course we wish him well and if you want to send him your best wishes you can email them to gwletters@bbc.co.uk. The Gardeners world site says that they will ensure that your messages are passed on to Monty. So Gardeners World will be headed by another – i cant imagine who can fill Monty’s shoes. I find myself wandering out the room or flicking the remote when any of the other presenters come on. Gardeners World has a tradition of having down to earth gardeners presenters – Jeff and Percy looked like they could handle a spade and did so regularly. I hope the new lead presenter is as passionate and as practically minded as the others. We’ll check our diaries, we might have a slot on a Friday night at 8! How nice it it to hear we have been missed. Thank you. Its been a busy time of late for the both of us, and unfortunately something had to be put to one side. That something sadly being our blog. 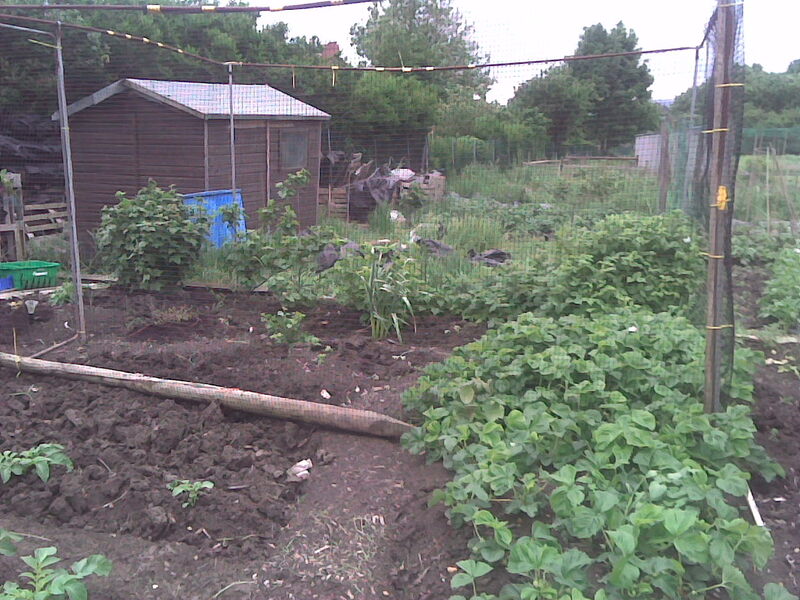 But rest assured the allotment is still going strong. We both started the RHS advanced course back in September, we took the first exam in February (soil science and plant propagation)…. It was hard going and seemed to take over our lives for a while. Glad to say we both passed. 3 more to go. We are now working towards the next , but luckily this one is not so intense as its not theory based, its all on your practical ability. We have a practical exam in September, so not as much of our time taken up now, so more time to get back to blogging. Also we both have new jobs, gardening in historic gardens part time, which is a wonderful job and a great opportunity. We have also set up on our own for 2/3 days a week. It took a while to come up with a name for our venture but after much deliberation we agreed on Gardening Angels. That too is going well. Its been hard cramming everything in over the last few months, the blog has gone down hill somewhat. 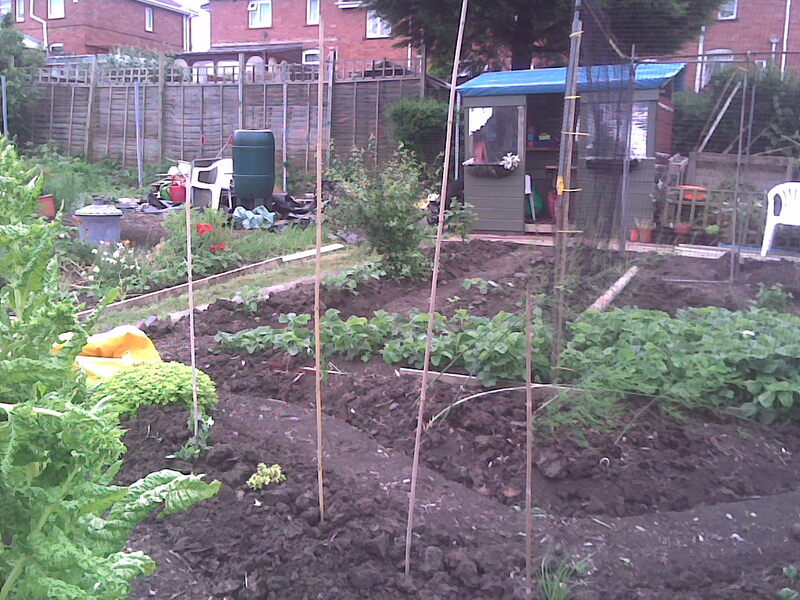 The allotment is hanging on in there tho. I manage to squeeze in a couple of hours after work in the week and as much as possible on the weekend. If you remember at first both keener and I practically lived at the allotment, now we are lucky to fit in a few hours, and boy don’t we know it when we talk to the other plot holders…”ooohh hello we haven’t seen you for a while, everything alright?” or “we don’t see you guys up here much now” I think they consider us part timers now, which we may be, but its all about how much we can get done in the short space of time we have for the allotment. We manage to cram in so much when we are both up there now, we work well as a team. We both spent 7 hours up there saturday tackling the weeds, mowing, re- edging paths, clearing out the shed and greenhouse and generally sprucing the place up a bit. What a difference a day makes! 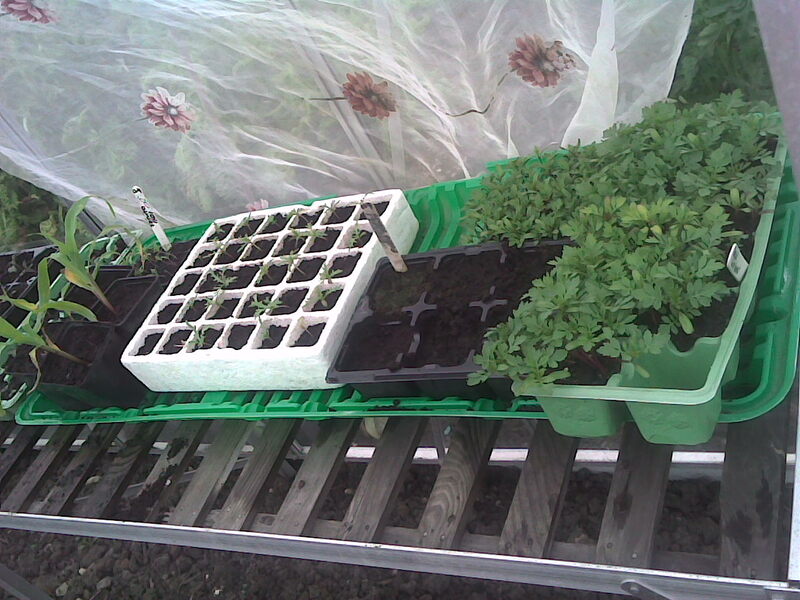 In our greenhouse we have, marigolds, calendula, chrysanthemum, purple kale, sprouts, broccoli, yellow tomatoes, leeks, spring onions, courgettes, melon, salsify, aubergine and more which right just now I cant remember. 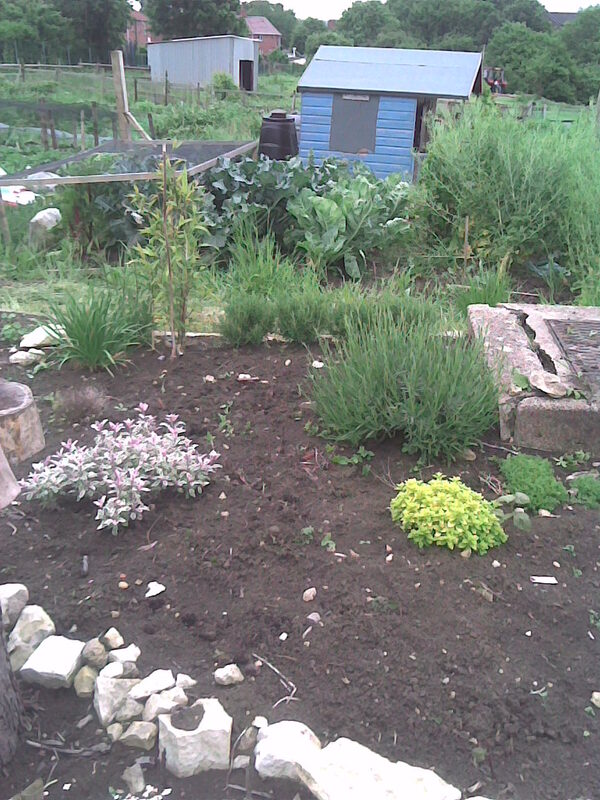 I feel back on track now, and the allotment looks great again. As you can see we have a lot of bare soil, we are lucky to have a free supply of manure, I only wish we had a constant supply of free time to pick the stuff up. We are preparing the soil by adding as much as we can. As we are adding it, its being gratefully and quickly eaten up by our crap soil. 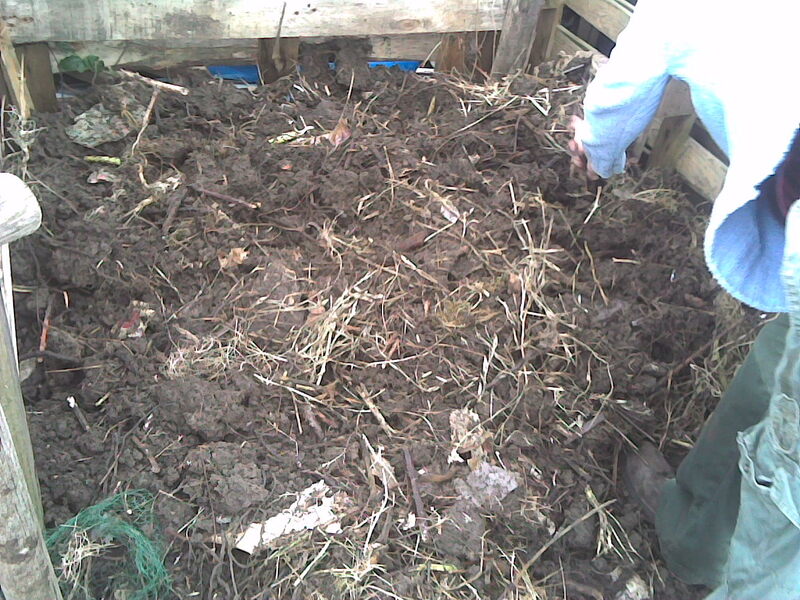 We added tonnes of manure last year, but you wouldn’t think it when you see how bad the soil is when digging. Our shed…still not finished, still not rain/wind proof but provides us with a nice place to sit and shelter with a magnificent view over our plot with an amazing back drop of Bristol. We still have out winding paths but they all need covering with wood chippings again. We were given a fruit cage which was great. Its a little old and needed some bodging. It isn’t big enough to cover all or the fruit so we have covered what we can and what is in most need of protection. In the fruit cage we have cranberry, black currant, white currant, raspberries, yellow raspberries, strawberries and gooseberry. Outside the fruit cage we have an apple bush and blueberries and more strawberries. 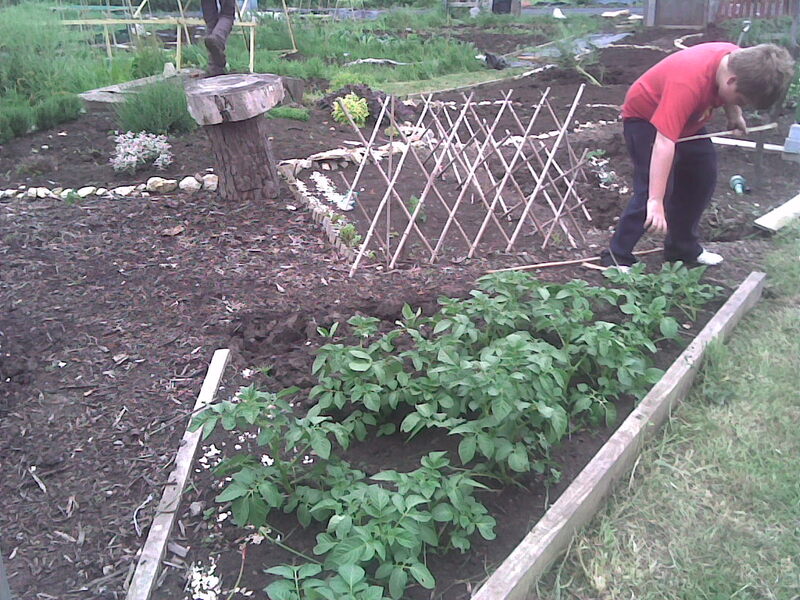 Young allotmenteer checking out potatoes for blight. So far no sign. 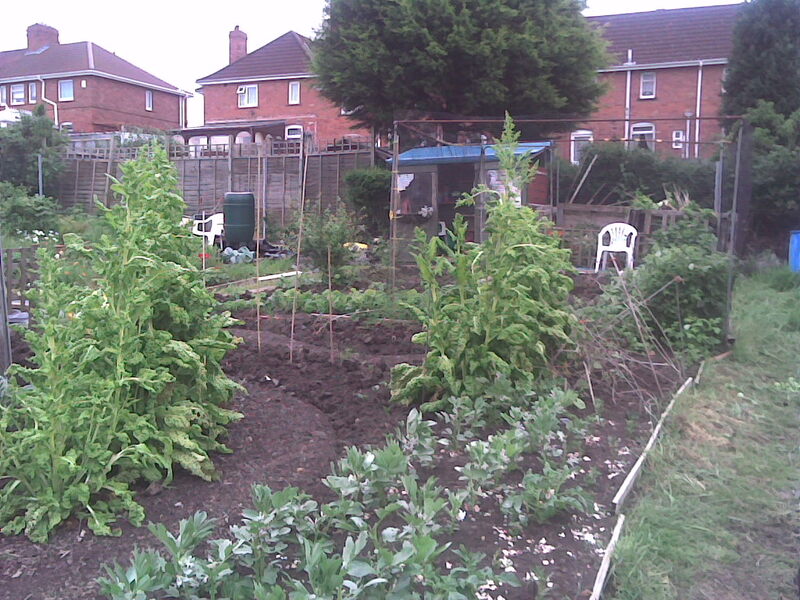 We may of gone a little over board with the Broad beans this year….hey anyone got any good Broad bean receipes? 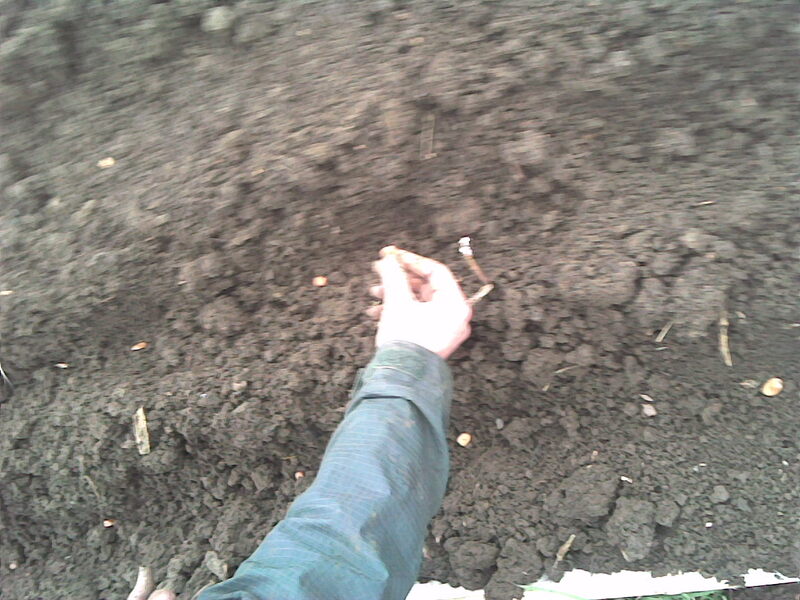 I took these photos yesterday on my phone so they are not the best, nor do they dont show the whole plot and what we have growing. More will be added. Its raining real bad here today so cant work or go to the allotment. Im forced to stay in and paint my sons bedroom which is gonna be difficult with a head filled with allotment to do lists. But we had a strict plan (for once) that we were gonna stick to – the reward would come at the end of the day when we would sow our broadbeans into the delicious soil that we have been nurturing. Next, we cleared all the broken glass from around the green-house. It is now more of an open plan construction, with more glass smashed than there is left in the frame. We are finished with glass – it will be smashing when we get our mitts on some perspex. We’re going to try and get some that is milky white to avoid the plant scorch house situation that occurred at times last summer. Plant torture is not big and is not clever. 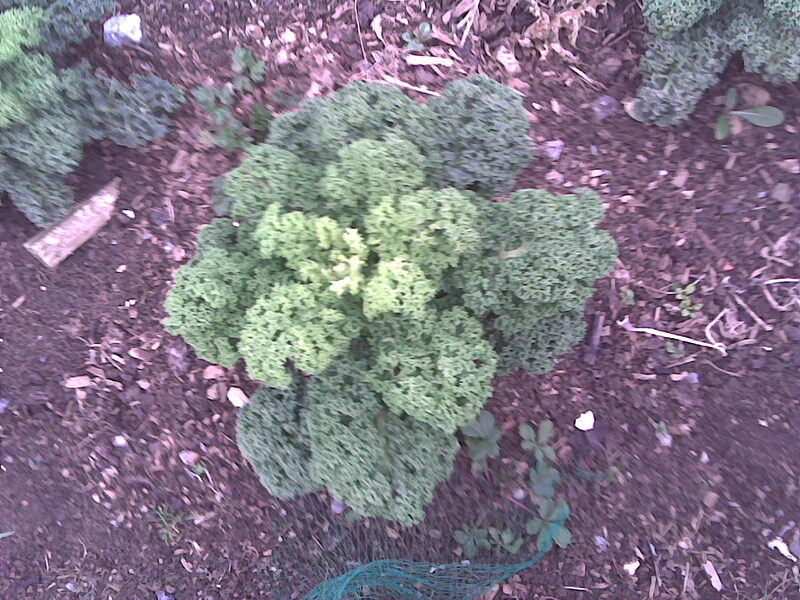 We planted some more asparagus into the, well the asparagus bed. Here came the absolute highlight of the day. I opened the box where we had stored our well rotted manure and discovered absolute gold. We jumped around delighted at the lovely black crumbly bread crumbs that had been produced. We both felt that this stuff was more valuable and precious than any diamond ring or necklace or snazzy car. So I filled the planting holes with this life giving substance, before safely nestling the asparagus crowns into their new home. Finally, we excitedly snuggled the broad bean seeds safely into their spot. Now as we mentioned we are both doing an rhs course, and this involves a practical exam to test out seed sowing skills. 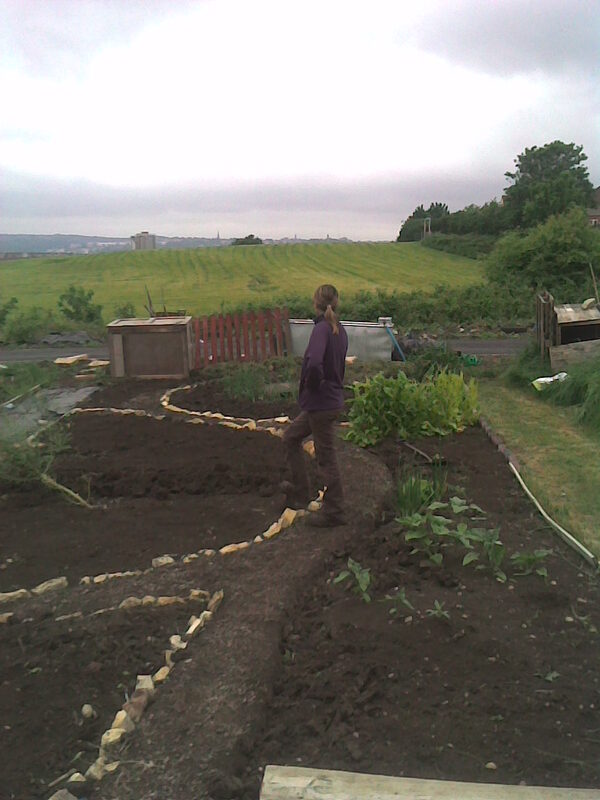 So in preparation for this and because we both like the allotment to look attractive, we got out our line so that we could get perfectly straight lines. We felt a little bit silly doing this but nevertheless we persevered as we continue to perfect our art… Four perfectly straight lines of broad beans, mission accomplished. I look forward to these nutty delights as they are definitely one of my favourite allotment foods. It wasn’t until we got back to beeners and were tucking into the shop bought cabbage of our well earned dinner, that we suddenly realised that we’d neglected to harvest any of the veg that we still have growing on the plot – curly kale, parsnip, two leeks, swede, turnip, swiss chard, pak choi and cabbage. DOH! But we did have the foresight to take a picture in preparation for writing this post. I’m sure you’ll agree that kale sure looks tasty!